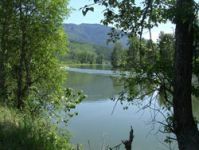 Nestled on the northeastern shore of Okanagan Lake, Ellison Provincial Park includes 200 hectares of forested benchlands above a rocky shoreline of scenic headlands and sheltered coves. The park's natural attractions, combined with the dry, sunny Okanagan climate provide many recreational opportunities from spring through fall. Warm waters provide excellent swimming at three main beaches. The park also features western Canada's only freshwater dive park, where sunken artifacts add to the fascinating plant and animal life. This park offers 71 vehicle accessible campsites, 8 of which are double sites. Campsite reservations are accepted (49 of these sites are reservable) and first-come, first-served sites are also available.